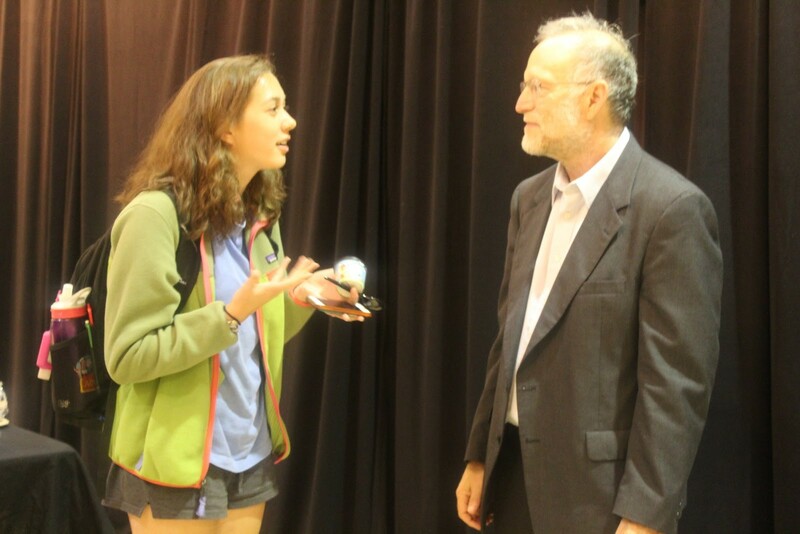 Jerry Greenfield, co-founder of Ben & Jerry’s, spoke of the correlation between business and advocating for social change in Hoff Theater on Tuesday. The event was hosted by Voices of Social Change, a campus program which provides a storytelling lecture for students. The program invites storytellers to share their experiences as active leaders in the local community. Natasha Teckham, the interim program administrative specialist for Stamp’s Leadership & Community Service Learning program, said Greenfield, a noted philanthropist, was chosen for his social values within the Ben & Jerry’s company. The program looked for someone who used their business to create different changes in the community and create dialogue on current issues. In her four and a half years working in the leadership office, Teckham has hosted eight guest speakers, including Cornel West and Angela Davis. Greenfield has previously worked on advocating marriage equality and also developed a line of ice cream dedicated to the Black Lives Matter movement. “You go to the grocery store and you see a flavor dedicated to the Black Lives Matter movement, and you’ll wonder to yourself ‘Wow. Okay this isn’t just a business. He wants us to talk about this issue because it is a problem in our country that minorities are being gunned down by the police’,” said Teckham. Teckham hoped the event would encourage people to talk about social issues, create dialogue and bring the campus community together. Also, after hearing a funny personal story from the guest speaker, Teckham thought that kind of outlet might inspire someone to contribute to their own community. But she said that was what she loved most about the company. They used what they love and managed to tie social issues into one set. But he said despite criticism, Ben & Jerry’s has tried to be as public as it can be. Greenfield listens to a student before taking pictures during the reception. Chidinma Onuoha/Mitzpeh. Greenfield said the company created a two-part bottom-line. In other words, they weren’t just going to make money, they were going to give back to the community. “It was just the way we operated,” said Greenfield. Initially, the idea was met with mostly positive reactions, but a few weeks later, one of Greenfield’s managers came to him and said they had a problem. Giving back to the community took away their ability to make money and vice versa since it cost both company energy and resources. Greenfield said the solution was to find a method that would satisfy both goals—making a profit and giving back to the community. One example was that Ben & Jerry’s became aware of Greyston Bakery, which is owned by a religious institution whose work was to provide jobs for people who have had problems with substance abuse and legal problems. They wondered if there was anything Greyston had that they could add into their ice cream flavors and they learned that the bakery made really good brownies. As a result, Ben & Jerry’s came up with a flavor called Chocolate Fudge Brownie based on the brownies purchased from Greyston Bakery and simultaneously supported the work that Greyston was doing. Pragya Gupta, a graduate student majoring in cyber security, came to the event because she wanted to meet Greenfield and thank him for all of the vegan flavors he provided. She said that one of her friends had met him in California and recommended that she take the opportunity to meet him. Gupta’s friend, who is vegan, posted on his profile that Greenfield was doing a tour in America and that if anyone happens to meet Greenfield, should thank him for the new vegan flavors and to ask for more. Once Gupta heard that Greenfield would be a guest speaker at this university, she said she had to do it. Greenfield said he learned that everyone’s actions are built off of deeply held values and that true marketing is an integrated attempt to meet another set of his customers needs. No Replies to "Ben & Jerry’s founder uses business to advocate social change"